Although David Byrne gave Ottawa a taste of his wonderfully wacked-out stage show during his 2013 appearance with St. Vincent, absolutely no one in the nation's capital seemed prepared for the pure brilliance that his 2018 solo tour would bring. As Tune-Yards and Ani DiFranco finished their respective sets, the CityFolk main stage was completely cleared of all equipment, instruments and speakers, while sounds of insects and birds wafted through Lansdowne Park's P.A. system, leading to the befuddlement of the aged festivalgoers. 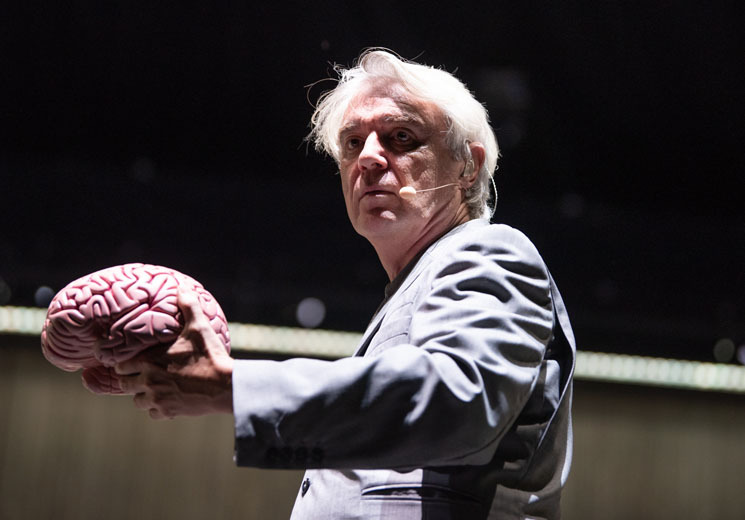 As curtains of thin stainless steel chains were raised to create a three-walled backdrop, a barefooted David Byrne suddenly appeared upon the barren stage wearing a tapered version of his iconic grey suit, while seated behind a table containing a model of a human brain. As the opening notes to "Here" (from his latest LP, American Utopia) rang out, Byrne rose to his feet to sing into his mic headset and serenade said plastic organ. Moving into "Lazy," his 2002 collaboration with British electronic duo X-Press 2, two backup singers emerged from the chains to accompany him. As he segued into a pair of Talking Heads tracks ("I Zimbra" and "Slippery People"), the trio of vocalists were joined by nine musicians, all sporting grey suits and all carrying mobile, wireless instruments. Launching into "I Should Watch TV" (from his 2012 collaborative LP with the aforementioned St. Vincent) and two new tracks, Byrne and his band made terrific use of the empty stage; marching back and forth in formation, the backup singers demonstrated their propensity for contemporary interpretive dance. Midway through the set, the slowly loosening crowd gave Byrne the biggest response of the evening when he transitioned into the Talking Heads' "This Must Be the Place (Naive Melody)" and "Once in a Lifetime," the latter showing Bryne recreating some of his jerky and dazed Stop Making Sense-era dance moves. Stretching out songs like "Like Humans Do" and "Blind," Byrne, his guitarist, bassist and keyboardist intensely riffed off of the towering beats created by his six-piece drum corps. Closing off his performance with a rapturously-received rendition of the Talking Heads' biggest hit, "Burning Down the House," Byrne returned to the stage to bring out Merrill Garbus (Tune-Yards) and Ani DiFranco to cover a strikingly impassioned version of Janelle Monáe's protest song, "Hell You Talmbout." As the 14 musicians stood shoulder-to-shoulder, shouting out the names of African-Americans who have been killed by law enforcement, much of the now fired-up crowd stood silent and once again seemed befuddled. As the Byrne and company exited the stage, the audience wildly demanded more — proving how Byrne could create brilliantly executed and touching modern theatre with nothing more than a dozen musicians, a repertoire of classic songs and one of the most adventurous brains in music.